Irton Pike sits at the western end of the ridge that runs along the southern side of Wasdale, peaking at Illgill Head above the Wast Water screes. Irton Pike is a prominant feature in many views from the coastal strip north of Ravenglass, and from many angles appears as a distinct peak, but this is rather misleading - Irton Pike has steep northern, western and southern flanks, but to the east it merges smoothly into the long ridge of Irton Fell, with hardly any drop. At one point Irton Pike was heavily forested, but most of the trees on the higher slopes have now been removed, so the fell is open again, and the views are unthreatened. The view up Wasdale is perhaps the best, but the coastal views are also good as is the view south towards the Black Combe area. There are two routes to the top of Irton Pike, both starting from a small parking area at the top of the road that runs across the fell on its way between Santon Bridge and Eskdale Green. The most dramatic starts from the forest road that heads west from the parking area and runs north up the steep slopes of the fell. This area used to be forested, but the trees have now gone. The starting point of this path is a little obscure but the route is clear. The easier alternative uses the track that leaves the road next to the parking area. This track climbs up across the fellside and emerges on the open fell. At this point turn left to follow the edge of the forest area, then left again and folow a path that leads across an almost level area to reach the summit. We have a short walk that climbs Irton Pike, a longer walk over Irton Pike and Whin Rigg and another walk that heads south from the car park into Irton Park. Stoney Beck forms the eastern and southern boundaries of the fell. The beck risese to the east of the fell, and flows south-west before turning west, eventually running into the River Irt west of Irton Hall. 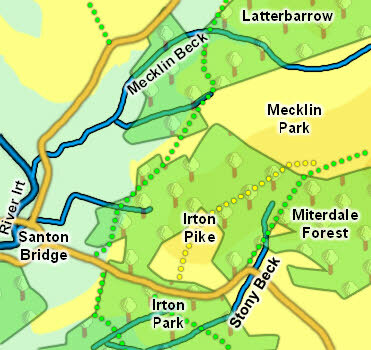 To the north a nameless beck rises beween Irton Pike and Mecklin Wood, and flows west to merge with Mecklin Beck. The combined fells then run west into the Irt just upstream of Santon Bridge.